GRÁINNE Reilly has always been a keen participant in Féile celebrations, even before she landed her ‘dream job’ with the organisation in time for the exciting Féile 30 celebrations. The 38-year-old Events Operations Manager joined Féile last August after she had taken a break from her career to enjoy time with her beautiful baby boy. “The last few years have been incredible getting married and starting a family, and now I have a job I just love,” she enthused. “When the opportunity came to be part of Féile I just couldn’t let it pass me by. The former Fortwilliam pupil said she has spent most of her life split across the North and West of the city, which she said shows her the importance of community festivals, having witnessed the ‘incredible transformation’ of the city over the last three decades. In 1988 the first Féile opened with a modest parade of floats, bands and GAA clubs walking to an open air party in Dunville Park, evolving into one of the major arts festivals in the North in recent years. Gráinne said Féile 30 is an opportunity to look at how far West Belfast has come in these 30 years. “Féile 30 is a stepping stone in commemorating the creativity of the last 30 years which we believe it something to be celebrated,” she explained. “If you look at West Belfast 30 years ago it was a very different place than what we know today and we at Féile feel that we have been taking that journey alongside the West Belfast community. “Of course the main bulk of attendees come from West Belfast but over the years that has become a diverse mixture including returning tourists or those who have chosen to settle in the community and make it their home and so we have a global theme celebrating this and encouraging people to have an outward look on the world and just how diverse we are. As Féile move closer to their 30-year celebrations they are getting warmed up with their spring festival Féile an Earraigh – a wide variety of arts and cultural events in the weeks leading up to and including St Patrick’s Day. “Our festivals just keep getting bigger and better and that’s definitely the case with Féile an Earraigh,” continued Gráinne. “Starting this weekend Féile and Earraigh will animate the city with traditional music sessions, master classes, concerts and walking tours. We never usually hold exhibitions during Féile an Earraigh but this year we have done just that at St Mary’s University from Monday March 12. 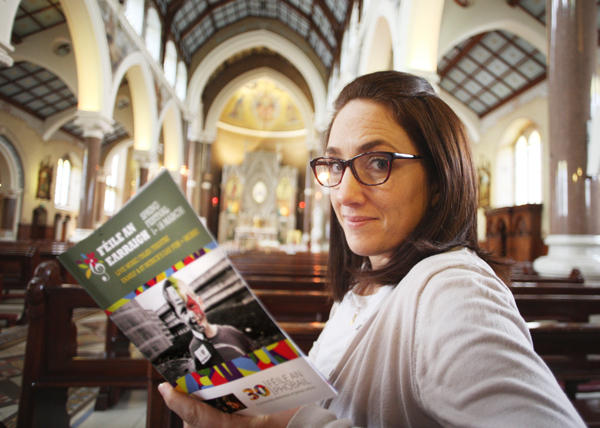 “We have the Priests coming to Clonard Monastery on Wednesday March 14, The Belfasters on Friday March 16 and ‘The Umpire strikes back’ by Grimes and McKee on Tuesday March 13 and much more, so make sure to grab a booklet or get online and see what you can get involved in,” she added.